One hundred and thirty years ago today, Vincent Van Gogh spent his thirtieth birthday re-reading Victor Hugo’s novel Les Misérables. How do I know this? It is one of the many, many details about the artist revealed in a comprehensive and compelling book, Van Gogh: The Life, by Steven Naifeh and Gregory White Smith, which I am currently reading. Its revelations and insights are a must for those who want a better understanding of the artist. Vincent Van Gogh has been my favorite artist since I was a child. I don’t remember when he came into my consciousness; perhaps it was the first time I saw and was awed by Starry Night. As evidence that both home and school play a part in imparting the appreciation of art in a child, I remember poring over a Time-Life book, The World of Van Gogh 1853-1890, that my mother bought our family when I was a teenager (Thanks, Mom!) 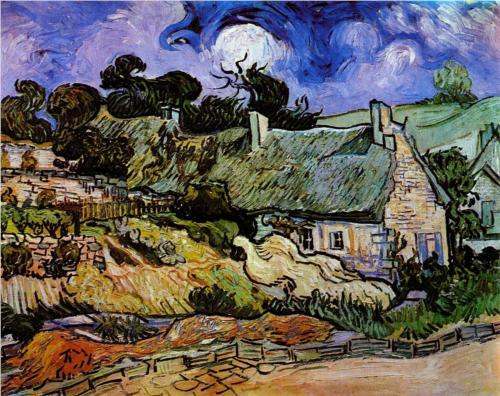 As a high school student, I painted a copy of Van Gogh’s Thatched Cottages at Cordeville, 1890, for an assignment. It was a study in shades of green and blue with an abundance of Vincent’s trademark brushstrokes. Imagine my pleasure when, as an adult, I came upon the original in the Musee d’Orsay in Paris. I celebrate Vincent’s birthday today on behalf of myself, and all whose lives were made infinitely richer because he lived and created the kind of art that lives forever in our hearts. You know how it is when you sit in a waiting room at a doctor’s office? Everybody just keeps to their own little space. Sometimes there is a nod of the head, or handing over of a newspaper, but mostly there’s just silence. Yesterday I was part of a friendly group that kicked the silence model right out the door. It started when two retirement-aged women started talking and comparing notes on something. I put down my Kindle and joined in. A man came in and he participated in the conversation too. One of the woman’s husband and adult daughter entered, so we all introduced ourselves. (Yes, we actually shared names in the doctor’s waiting room…unheard of!) A couple of people noted how much fun we were having, and one called it a party. It was almost sad when the nurse came to call somebody into the examination room and they had to leave. While her mother saw the doctor, the daughter and I had a nice conversation about retailing. After they left, one of the woman who had been telling us about her frustrating medical condition popped her head in before she left to let me know she was doing much better. Then I was alone in the room. Before long, an elderly man came in, preparing to sit in the usual silence. I wasn’t ready to let the conversation end, so I asked him a question. Before long, he was telling me about his life – he was in his nineties and was upset he couldn’t do all the things he used to be able to do. He had a lot of physical complaints and didn’t seem to have much companionship in his life. I am hoping that maybe a brief show of interest from a stranger may have given him just a little comfort. I wished him well. When I went back to college a few years ago, I chose to major in Communication Studies. I became passionate about the power of honest communication and authentic interactions to change the world. Yesterday we might not have made any big, outright changes, but together a small group of people helped make a positive impact on each other’s day. That has to be a contribution to what is right in the world. This morning I got out of bed and looked out the window with the delight and wonder of a child. An overnight snowfall covered all surfaces in a fluffy pure white blanket. Snow gathered in smooth clusters on the outstretched limbs of pine trees and delicately coated every twig of the deciduous trees, creating a lacy pattern. It mounded up in little domes on top of the outdoor grill and birdfeeder. The world outdoors at my home, surrounded by nature, away from traffic and snowplows, was perfectly peaceful and beautiful. I am a Minnesota snow-lover from the tips of my heavy winter boots to the top of the fur-trimmed hood on my parka. Even the fact that it is now March and spring is within sight doesn’t stop my swoon at the sight of a falling mist of white crystals. My love of snow has also been revealed in the artwork I have been creating lately. 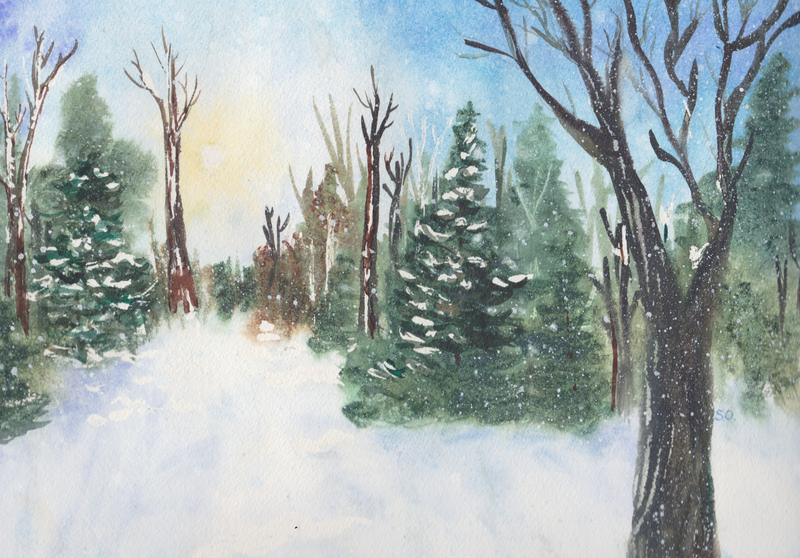 Above is an example of a recent snowscape I painted in watercolor. I posted a couple more paintings on my Artwork Page. Later today I’ll do some shoveling. The snow won’t last long this time of year, but right now I keep looking out the window and smiling.